With summer almost upon us it’s time to dust off those walking shoes, get the cobwebs out of your day pack and head outdoors! So here are 10 top summer walking destinations guided by Life’s An Adventure. First off the rank is the ever-popular Three Capes walk which explores the beauty of the Tasman Peninsula. You’ll see dramatic coastline including the world’s highest sea stacks whilst meandering through pretty eucalypt forests. You’ll walk to Cape Raoul and Cape Hauy and see Cape Pillar from the air on a helicopter or sea on a cruise. We then head to the other side of the island to explore the remote and mysterious Tarkine wilderness. This three-day walk explores magnificent rainforest, wild coast and dramatic mountains. There are few places left that can be truly described as wild and untouched, but the remote Tarkine is one of them. Heading to Victoria, our first choice is the three-day Great Ocean Walk. You’ve heard of the Great Ocean Road, well there’s also a walking track showcasing this dramatic piece of southern coastline. You’ll experience a diversity of natural landscapes from tall forests and coastal heathlands and experience the Shipwreck Coast including the sandstone sea stacks of the Twelve Apostles. And the pièce de résistance is a helicopter fight over the famed Apostles! 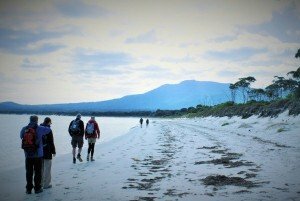 Two other Vic destinations worth considering are the three-day Wilsons Prom walk, with its granite mountains, lush rainforests, pristine beaches and stunning coastline, and the three-day Grampians walk. Covering 168,000 hectares the Grampians National Park is renowned for its ancient mountainous scenery and you’ll get to walk parts of the new Grampians Peaks Trail. In NSW you could consider the famed Six Foot Track. This three-day guided walk goes from the Jenolan Caves to Katoomba in the Blue Mountains. Winding through state forests and national parks, the Six Foot Track follows the 44km route of the original 1884 bridle track and there’s plenty to see and experience. If you want something a little more tropical then you could consider the UNESCO Heritage listed Lord Howe Island. It’s one of the most beautiful places on earth and there are plenty of outdoor activities to choose from included gorgeous guided walks. Crossing the other side of the continent we have two fabulous WA destinations. 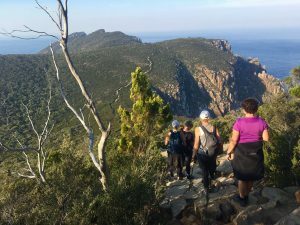 The famed Cape to Cape walk – with endless coastal scenery and a wonderful choice of vineyards. And southeast of the Margaret River region is the Bibbulmun Track where Life’s An Adventure has a five-day guided walk like no other. Discover the varied landscapes of the Bibbulmun and the local wine regions. Walk through the stunning and tranquil South West Forests with their towering karri and tingle trees, including pretty Beedelup Falls near Pemberton. So there you go. Ten unique pack-free walking destinations set for your summer holidays. Now the biggest challenge is choosing which one to do!